New Balance Fresh Foam Boracay v3 are neutral cushioned running shoes. 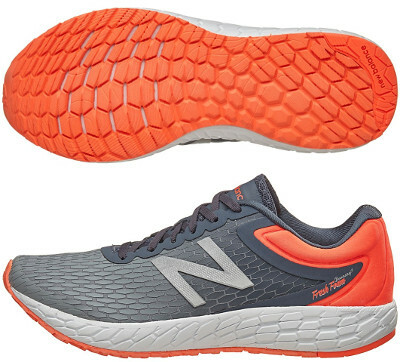 The New Balance Fresh Foam Boracay v3 updates the proposal of lightweight training shoe with generous cushioning and just 4 mm drop for a more natural running, between the more popular and premium 1080 v7 and more responsive Zante v3. It is a great choice for running long distances and daily training. Innovative upper has been completely reenginered from its predecessor Fresh Foam Boracay v2 with 3D screen printed synthetic fabric which would need feedback from unbiased runners to check performance regarding fit and breathability but is definitely a disruptive eye-candy one. Bootie construction and absence of seams offer great comfort and reduce chance of irritation. Midsole in Boracay v3 is completely made of Fresh Foam material featuring plush (not mushy) cushioning with limited stability depending on hexagonal geometry configuration of each area. Outsole has been slightly redesigned with different volume elements depending on the area for smooth transition while crash pad remains pretty similar to support heel strikers.